It’s not often that an important historic building emerges unscathed from decades of institutional use, but the sale by the Home Office of Grade I-listed Bramshill House and its 262-acre, Grade II*-listed park and gardens, near Hartley Wintney, north-east Hampshire-home of the Police Staff College since 1960- highlights the remarkable long-term restoration of the great, 43,000sq ft, Jacobean mansion that remains at the heart of the conference facility, whose 315,000sq ft of modern buildings are widely dispersed around the estate. Knight Frank (020-7861 5427), who are handling the sale on behalf of the Home Office, quote a guide price of ‘excess £20 million. A deadline of early October has been set for receipt of ‘initial expressions of interest’ from what is expected to be a wide range of institutional, educational and training organisations, as well as commercial and residential developers. Although planning restrictions preclude high-density housing development, Emma Cleugh of Knight Frank believes that ‘there may even be scope for an enclave of grand country houses along the lines of the Wentworth estate’. The earliest references to Bramshill date from Saxon times. In the 14th century, it was the home of Thomas Foxley, who rebuilt Windsor Castle for the Crown, and appears to have used masons from Windsor when building a fortified manor house for himself at Bramshill in 1327. In 1605, Edward Zouche, 11th Baron Zouche of Harringworth, bought the property from Sir Stephen Thornhurst, demolished the greater part of the existing house, and began building the ‘great Jacobean palace’ that was completed in about 1615, or possibly later; he also created the walled gardens, the maze and the 15-acre lake. In any event, he achieved his ambition of royal recognition when James I visited the house in 1620. 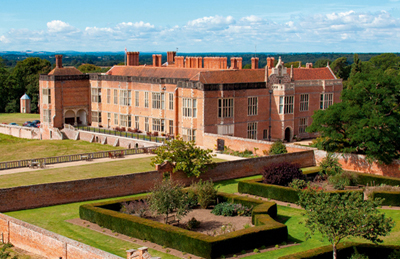 In 1699, Bramshill was bought by the Cope family and remained in their hands until 1935. The Copes made a number of structural changes, including the removal, in the 1720s, of the fire-damaged south-west entrance courtyard, and the creation of the mezzanine floor and Queen Anne Stairs. In the late 1800s, substantial external repairs were carried out, the ground floor of the north wing was reorganised and bathrooms were installed. In the 1920s, a former billiard room and dining room were knocked together to create the morning room. Bramshill’s other principal rooms include a long gallery, a great drawing room, a chapel, a dining room and a grand entrance hall. The entire complex boasts 329 bedrooms. During the Second World War, the house was used by the Red Cross as a maternity home for evacuees from Portsmouth, and then as a home for the exiled King of Romania and his family. The last private owner of Bramshill-said to be one of England’s most haunted country houses-was Ronald Nall-Cain, 2nd Baron Brocket, who sold the estate to the Home Office in 1953. Not all builders of Jacobean houses shared the lofty ambitions of the various owners of Bramshill, for whom size clearly mattered greatly. 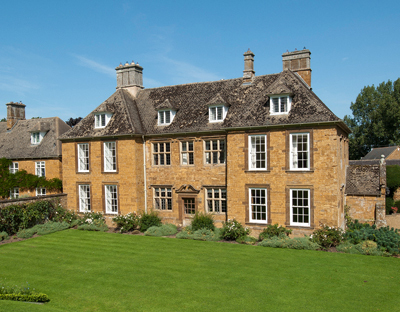 An article by Arthur Oswald in Country Life (September 5, 1947) traces the evolution of another fine Jacobean house, Grade II*-listed Arlescote House at Arlescote, on the Oxfordshire/Warwickshire border along the more traditional path traced by many ‘smaller’ country houses, from ‘first, a Saxon holding, later a monastic estate, then the mansion house of a yeoman farmer, subsequently rising to the status of gentleman’s seat’. The Domesday Book names the Saxon incumbent of Arlescote as one Bovi, but after the Conquest, the estate was granted to the Norman Abbey of Préaux. Following the dissolution of the monasteries, Arlescote was sold to the Coopers, a family of yeoman farmers who over-extended themselves and eventually disappeared from the scene in a cloud of debt. The property was bought in 1648 by William Goodwin, a major local landowner, described as a ‘gentleman’ of Hornton-a village famous for the fine blue-green stone from which Arlescote is built. The main part of the house was built in 1625, the last year of James I’s reign, probably by Manasses Cooper, the last of the Coopers to live there. And it was the Coopers who enjoyed Arlescote’s royal moment in the sun. The house sits on the lower slopes of Knowle End, adjoining Edgehill, scene of the first battle of the Civil War in 1642. The historian John Aubrey relates how Charles I’s sons, the 12-year-old Prince of Wales, and his nine-year-old brother, the Duke of York, stayed at Arlescote House with their tutor, Dr William Harvey, who sat calmly reading a book while the battle raged nearby. The Goodwins enlarged the house in 1685 and again in 1710. Some of the earlier alterations may have been influenced by Inigo Jones, who was working nearby for at least part of this time. Further alterations were carried out in the mid 18th century, and again in the late 19th and early 20th centuries. Behind its beautifully symmetrical main façade, Arlescote House-now for sale through Knight Frank (01789 297735) at a guide price of £4m-has also been sympathetically remodeled and updated by the present owners. In addition to the impressive panelled drawing room (previously the main hall) and sitting room, both of which look south towards Edgehill, the house has a dining room and library, a large kitchen/breakfast room, various utilities, a billiard room and upstairs sitting room, eight bedrooms and eight bathrooms.  Secondary buildings include a converted two-bedroom coach house, garaging, stabling, pavilions and stores. Arlescote’s 18.78 acres of gardens and grounds include a tennis court, a swimming pool, paddocks and pasture. A couple of small canals in the gardens may once have formed a moat around the house, with outlets flowing to the Severn at one end and the Thames at the other. Down in east Kent, Grade II*-listed Bridge Place at Bridge, three miles from Canterbury, was owned by St Augustine’s Abbey until the Dissolution, when it was granted by the Crown to the Lawrence family. In 1638, it was sold to a Dutchman, Sir Arnold Braems, the first manager of Dover Harbour Board. He built himself a splendid new house in the Jacobean style, later described by Hasted as ‘a spacious and magnificent mansion… of the size and stateliness, full sufficient for a gentleman’s residence’. The present, 11,500sq ft, L-shaped building is all that remains of the original mansion, the rest having been demolished by a subsequent owner between 1704 and 1729. 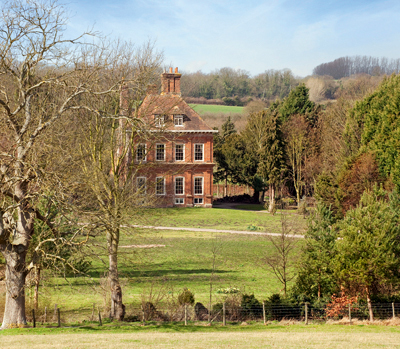 Set in 6.3 acres of picturesque gardens and grounds traversed by the River Nailbourne, Bridge House has been lovingly cared for during the past 47 years by its erudite owner, Peter Malkin, a veteran of numerous country-house restorations in Kent and Devon. Currently used as a part-time country club, the house has some wonderful rooms, including entrance and reception halls, five main reception rooms, eight bedrooms and seven bathrooms. The Jacobean oak main staircase is particularly fine, as is the ornate plasterwork of the main bedrooms. Strutt & Parker in Canterbury (01227 451123) want ‘offers in the region of £3m’.